I was going to write a really dramatic, horribly irritated and damning post about what I’m calling the “oven debacle” and how rubbish Curry’s have been. But you know what? I’ve run out of steam. I’m too tired. I’m tired of being stressed over everything—too tired of not being able to handle the 1-2 punches that have been landing me square in the middle of my psychological gut. This past Sunday, I spent the entire day deep cleaning the flat in preparation for the Christmas holiday. And when I say all day, I mean I got up, had my coffee and got started. By about 4pm, I was knackered but finishing off the last bit. I had even put my bathwater on for a nice bubbly soak before I had to cook dinner. Then it was like a damn explosion… glass everywhere… in my hair, across the flat, you name it. 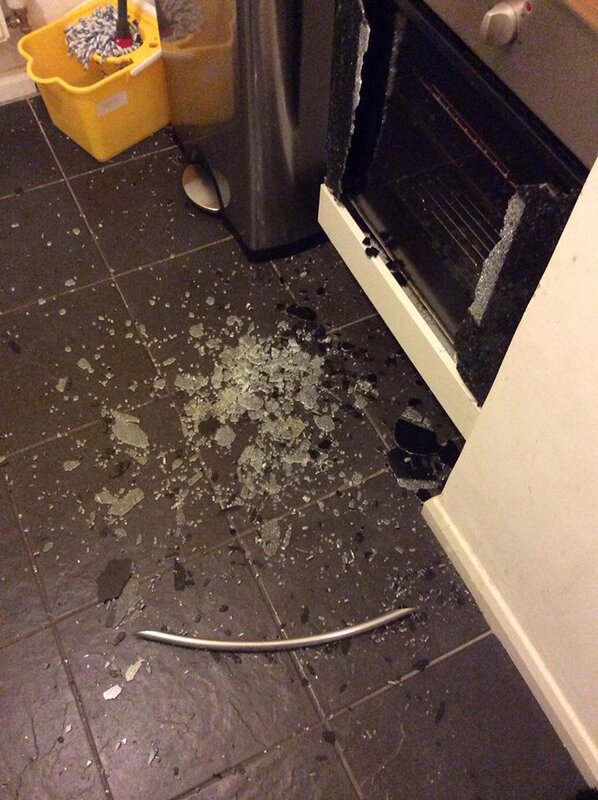 The tempered glass on the front of my oven had shattered into no less than a billion pieces when I tried to open it. It was scary and I completely wigged out. The floor was covered in so many tiny pebbles of glass that I had to use the pan I was holding to sweep aside a path to get out of the kitchen. The oven hadn’t been on in days and all I’d done was open it. Apparently, this isn’t horribly uncommon but is still rather crazy and terrifying. It was even more terrifying to look down and see my legs covered in blood. Flying glass had cut my legs up, though thankfully the cuts were pretty much like cuts you get when shaving—and every woman knows that when you nick your legs they bleed for days. Landlord was a gem—the oven’s less than a year old so he phoned Curry’s straightaway and put them in touch with N to liaise with repair/replacement details and dates. Curry’s policy was to respond to the complaint/issue within 24 hours… or so they told N.
24 hours later, their policy was actually 48 hours, not 24. Fine. 48 hours later (last night) N was told that someone would be in touch within another 24 to 48 hours and that because it was Christmas, response times were “out the window” (their words). Curry’s are rubbish. If given the choice, I’ll always opt for the same product somewhere else, no matter the price difference. Curry’s could have it £100 cheaper and I still wouldn’t buy it because, let’s be honest, you get what you pay for. I don’t need this added stress, I’ve got enough, thank you very much. So I’m 99.9% sure I won’t have my oven back anytime soon. I’ll be tweeting a picture of the carnage and calling Curry’s out on the issue every day until they respond. Feel free to link this blog post around wherever… If I can save someone from the horror that is Curry’s “customer service” then I’d be thrilled. Thanks, lovely. I’m to the point where I can’t physically take much else so I’ve just had to let it all go in order to keep my sanity. I haven’t even been able to read a book I’m just so mentally exhausted! You’d think a company whose product actually physically injured you would make an effort to get their response time back IN the window. Appalling service! Maybe time to find your long-buried Jewish roots and get Chinese takeaway on the 25th. We were actually thinking of hauling the BBQ out, provided it doesn’t rain/isn’t too cold, and smoking our beef. Either way, we’ve got booze galore so we’ll make it all ok.
That’s just horrible! I sure hope they do something about it soon! You and me both. I feel like I’m going to have a breakdown. And now my washing machine has packed in. Can’t believe it. Surely the boiler is next. Oh FFS! You are well overdue some luck.